Sterling Publishing (NY), 9781454928577, 320pp. 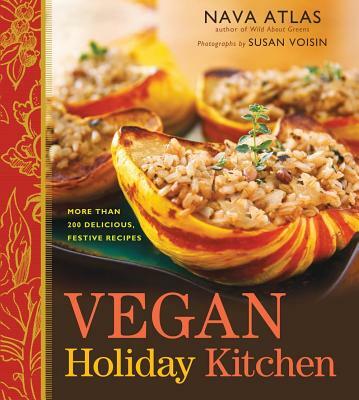 Have yourself a happy vegan holiday This exciting, inviting cookbook by veteran author Nava Atlas features more than 200 delectable, doable recipes for every festive occasion. Atlas, one of the most respected names in vegetarian and vegan cooking, brilliantly fills the biggest gap in the vegan repertoire by addressing everything from Thanksgiving, Hanukkah, and Christmas to celebratory brunches, lunches, dinners, potlucks, and buffets. Such mouthwatering dishes as Coconut Butternut Squash Soup, Green Chili Corn Bread, Hearty Vegetable Pot Pie, delicate Ravioli with Sweet Potatoes and Sage, and Cashew Chocolate Mousse Pie will convince even the most skeptical eater that vegan cooking is well worth celebrating. One of the most respected names in vegetarian and vegan cooking, Nava Atlas has written nine previous cookbooks. She is considered an expert in meat-free holiday fare, which is the most popular area of her website, www.VegKitchen.com.